Find your way around the night sky with this handy guide to stargazing for beginners, written by Sir Patrick Moore. 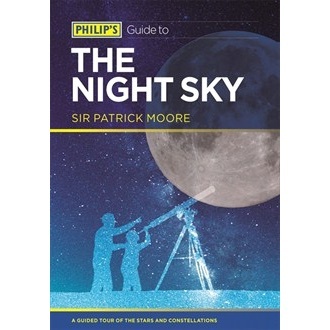 In Philip's Guide to the Night Sky, Sir Patrick Moore explains how to find the most famous constellations and the brightest stars, and when to look for them. Clear star maps, showing stars visible to the naked eye, help you to navigate the skies. The maps are suitable for use in Britain, Ireland, northern Europe and Canada. Sir Patrick introduces the wonders of the night sky to absolute beginners in his characteristically entertaining and informative style. The Moon, the planets, the Sun and the stars are explained in non-technical language, while the constellations are described with the help of star maps and tables. The four main chapters in Philip's Guide to the Night Sky are devoted to what's on view in each season of the year. The information is appropriate for observers in Britain and Ireland, northern Europe and Canada; it will also be helpful a little outside these latitudes. Using prominent patterns, such as the Plough and Orion, Sir Patrick teaches the reader to 'star-hop' from constellation to constellation, thus learning to navigate the night sky. Star maps and photographs illustrate and clarify what will be on view. Philip's Guide to the Night Sky is an ideal introduction to stargazing, suitable for all ages and with no need for anything more technical than the naked eye. Sir Patrick Moore was the author of more than 100 books and presenter of the world's longest-running television series, The Sky at Night. He was a Fellow of the Royal Astronomical Society (Jackson-Gwilt medalist), a member of the International Astronomical Union, and holder of the Goodacre Medal from the British Astronomical Association, of which he was president from 1982-84 before becoming Life Vice-President. In 1967 he was awarded the OBE for his services to astronomy, in 1988 the CBE, and in 2001 he received a knighthood. Sadly, Sir Patrick Moore died in December 2012.